A Plymouth occupational health nurse consultant has been elected to the governing council of the Nursing and Midwifery Council, giving OH nurses a voice on the regulatory body for the first time. David Maslen-Jones, a nurse consultant in occupational health at Plymouth Hospitals NHS Trust, is the first OH nurse to be represented on the NMC council, although professor Ann Lowis of Robert Gordon University, Aberdeen, did sit on the council of its predecessor the UKCC. 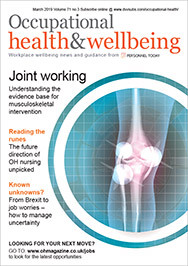 The average turnout among nurses was 14%, but among OH nurses this rose to more than 50%, a sign of frustration within the profession at its lack of recognition in the past, Maslen-Jones told Occupational Health. “I was very surprised because we are very outnumbered as OH nurses within the NMC,” he said. “It is all about influencing and trying to shape the way OH nursing is moving in the future,” he added. OH nurses often felt left out on a limb when it came to NMC decisions, and there was a sense many nurses did not fully understand what OH practitioners did, Maslen-Jones suggested. There was also continuing concern over the transfer of OH nurses to part three of the NMC register – specialist community public health nursing – a move many felt would only lead to more confusion, argued Maslen-Jones. “There is an awful lot of concern about the changes to the register, and changing the role of OH nurses to be more public health focused,” he said. Another issue was the ever greater stresses and workplace pressures being felt by OH and other nurses throughout the NHS, Maslen-Jones added. One of only five OH nurse consultants in the country, Maslen-Jones has previously worked in OH roles for companies such as Welsh Water, Devonport Dockyard and the Defence Research Agency. However, his voice will be limited on the council. Maslen-Jones was elected as the alternate member for the specialist community public health nurses committee, which means he comes second after registrant member Patricia Southgate, a health visitor from Kings Lynn. This means he will be involved in any decisions involving specialist community public health nurses and consulted on any decisions being made by the council, but will only vote when Southgate is absent. The council will take up office on 31 July.